At their location in Linz, the steel specialist voestalpine weld drive axle casings for industrial vehicles with a chained CLOOS robot system. The complex system consists of four welding stations and seven robots in total. The axle casings are fully-automated moved from station to station by means of a shuttle system. 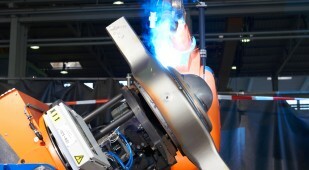 At the fourth station a QIROX QRC 350 robot welds the mounting ring to the axle casing. 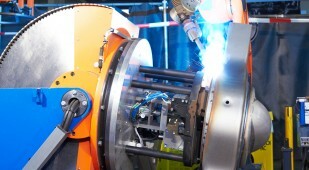 Both components are fully-automated inserted and fixed in the clamping unit. Then the positioner with turning/tilting movement positions the axle casing perfectly for welding. First, the robot joins the mounting ring and the axle casing. Then it welds the external seam of the hood. 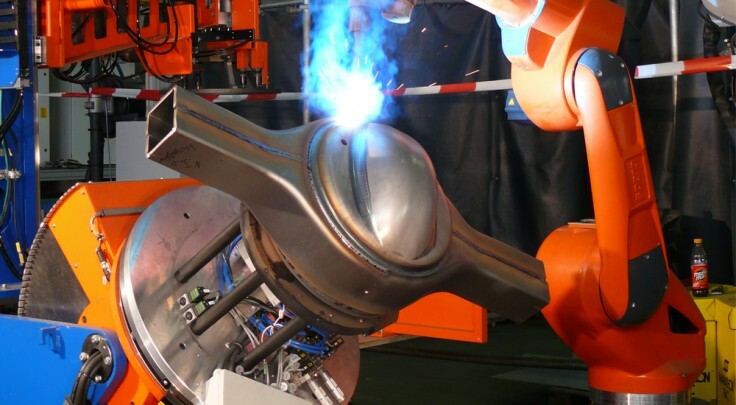 After these steps the shuttle system moves the completely welded axle case fully-automated to the next production station.